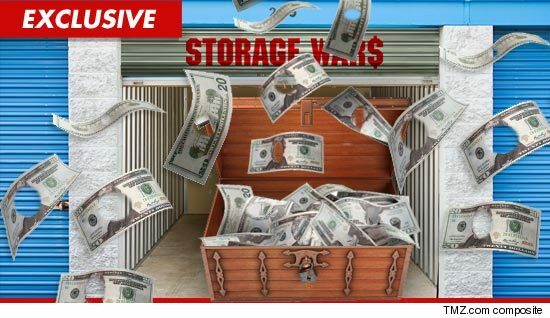 It's the creepiest jackpot ever -- a recent bidder on "Storage Wars" paid $400 for a bunch of crap, including an old trunk ... which contained a shocking $24,000 in cash ... but for some reason, none of the bills had faces on them. In case you're unfamiliar -- the A&E show features auctions in which people bid on the abandoned contents of large storage lockers ... but they only get a few seconds to see what's inside. Laura Dotson -- who runs the auction company for the show with her husband Dan -- tells TMZ, the buyer paid the $400 for the locker ... and soon after, discovered the MOUNTAIN of cash inside the trunk. The eerie part -- whoever owned the trunk beforehand drilled the faces out of every single bill. It's unclear why, but we're told the money was still considered legal tender ... despite losing face. U.S. Treasury Fun Fact -- A bank will accept bills with the faces cut out ... if the both serial numbers are still in tact and the bills pass a series of tests.